In this paper, we present an efficient adaptive moving mesh finite element method for the numerical solution of the Keller–Segel chemotaxis model. The mesh points are continuously redistributed by a coordinate transformation defined from the computational domain to the physical domain to concentrate the grid nodes in regions of large solution variations in the physical domain. The Keller–Segel equations are discretized using an implicit-explicit finite element method using piecewise polynomials defined on triangular meshes. The spatial discretization scheme is designed with a positivity preserving property, if the initial solutions of the physical model are positive then the computed solutions stay positive at all time levels. Several numerical experiments are presented to demonstrate the performance of the proposed method for solving Keller–Segel model. 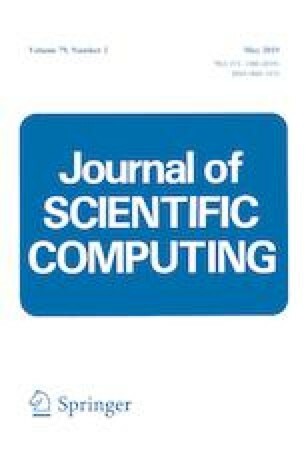 The numerical results show that the proposed method can reduce the computational cost while improving the overall accuracy of the computed solutions of the Keller–Segel model. The second author was partially supported by the NSF MRI Award No. 1531923, and would like to acknowledge the funding he received from the Graduate School at Wright State University.